Liam Fineman is honored to serve as President of UVA Mock Trial for a second term. As a Fourth Year member of UVA Mock Trial, Liam has competed as both a witness and as an attorney. 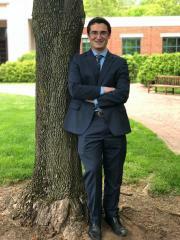 Liam was able to put his skills to the test as a Law intern at the U.S. Attorney's Office for the Eastern District of Virginia this past Summer. Before that, Liam interned with the DOJ working with the Office of Vaccine Litigation. When he is not in the courtroom...or at Mock Trial practice...or studying... you can find Liam cheering on his brother, and Union Hockey Defenseman, Fletcher Fineman. Liam is a double major in Chemistry and Archaeology and an avid LEGO enthusiast. View Liam's career individual awards by clicking here.